This Biegler Bladeworks Stinkfinger balisong offers an impressive custom design for all of your flipping needs. 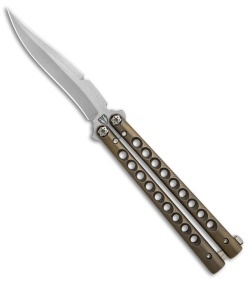 It has a skeletonized titanium handle with a bronze anodized finish. The blade comes in a trailing point style with a swedge and a recurved edge. 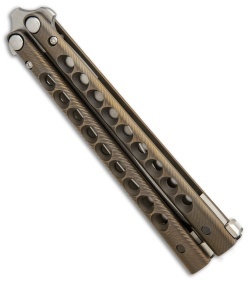 It has bushings and phosphor bronze washers for a smooth riding blade. Satin finished hardware and a titanium latch finish off the custom design.